The world teaches our kids that they are awesome and that they can achieve anything they want. As parents, this can seem an attractive message; we want our children to succeed, to be happy, and to have confidence. But as Christians we also want our children to grow up knowing and loving Jesus. It can be difficult to know how we can encourage and build up our children while also teaching them that they are sinners in need of grace. That is the publisher’s description of my new book, Parenting Kids in a “You can do it!” World. In this little book, I give eight signposts for parenting in this arrogant age. PRE-ORDER HERE. There are generous quantity discounts for your church. 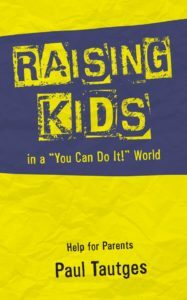 CHECK OUT the entire Raising Kids series.